A Halloween card for two challenges. First, the sketch at Just Add Ink#431 here. And then the colors are for Fab Friday#148 here. 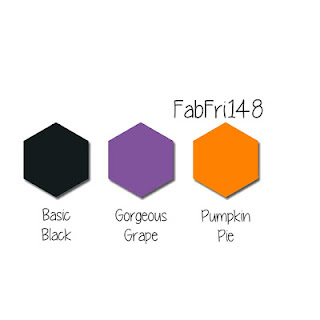 The colors to use are Basic Black, Gorgeous Grape and Pumpkin Pie. Labels to Love is the stamp set with some Brights 6 by 6 DSP. Love this, Jennie! How have I missed that Labels to Love set - great inking job! You're making our colors look awesome! Thanks so much for playing at Fab Friday! 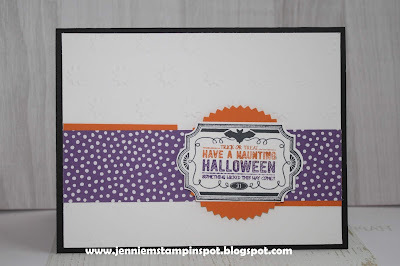 What a fab Halloween card Jennie. Love the multicoloured sentiment and the way you have used our sketch. Thanks for joining us this week at Just Add Ink. I love how you highlighted the sentiment by using different colours Jennie, such an effective technique that looks great and also adds lots of interest. 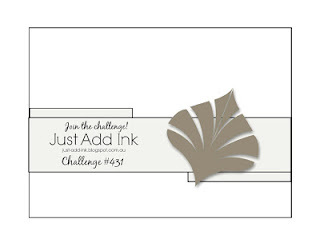 Thanks for joining us at Just Add Ink this week. Such a lovely Halloween card Jennie! I love the fun strip of grape DSP and how the orange edges really make it pop agains the white background. Your two toned sentiment is brilliant and a fabulous way to bring all the details together. Thanks for sharing with us at Just Add Ink this week.